It has been Capitalism that built more wealth in more hands than ever in the history of the world. Capitalism gave the common, ordinary man (or woman, to appease you feminists) the ability to design, manufacture and sell whatever dream they had and gave the people of the United States of America the highest living standard in history along with the freedom to enjoy it. It took work and the rugged individualism we once were noted for. But, socialists and Marxist leaning folks object to that and have been very gradually stealing our ability to grow and prosper in America for several years now. Smell a little Communism disguised there yet? From where I sit, it is obvious they do not. After all, it is always Democrats wanting more and more regulation of private land, business and even people’s habits. It is primarily Democrats always pushing for taxation to fund social welfare or to forcibly change societal behaviors. It is mostly Democrats pushing to separate us from our private modes of transportation and into public transportation as well as giving up our privately owned homes in order to live in some Democrat proposed High Density Housing along public transportation routes. It is Democrats sponsoring calls to regulate what our children eat at lunch time in school or even whether or not we may allow them to walk to school. It was Democrats that hoisted Obamacare on us then boasting more people than ever now have medical insurance. While that may be true, more people than ever are not receiving the medical care they expected or have to endure extra long waits for an appointment, provided they find a doctor close enough to them to see them. Currently, in Washington State, we see our legislature going into a second special session over their failure to reach a budget agreement, Republicans writing a budget that funds everything without increasing taxes and once again, Democrats holding out for more tax increases, primarily a Capital gains tax that I see as their foot in the door to eventually impose an income tax on the people of Washington State. All over the country, we see Democrats striving to remove our ability at self-defense by restricting our ability to legally own or carry a firearm. They tell us we do not need the weapon, we can depend on the Police. Yet, as we recently saw in Baltimore, they condemn and arrest the Police for doing the very job we hire them for. Now here is where it is not only Democrats, but some that claim to be conservative come closer together as they work to undermine our law enforcement, limiting their ability to effectively Police our neighborhoods with their incessant drone of anti-Police chatter. As they unfreeze relations and adopt many policies of Cuba, a once thriving, bustling Island Nation 90 miles from our southernmost east coast, is there any reason to think we would fare any better? Venezuela adopted these policies and today, they too are on the brink of economic collapse. We don’t need to even look to Cuba and Venezuela when we have similar examples right here in America with Detroit, once a great city that now sees large portions lie in ruin after decades of Democrat leadership over the city. This is what lies in store for us if we continue to fall for the platitudes coming from the likes of Bernie Sanders and nearly every Democrat elected official, at any level. Sadly, there are also many Republicans that have fallen prey to similar platitudes and too easily cave or agree with the Socialist Democrats. The so-called “wage gap” is but a smoke screen as lower wage workers also fare much better personally when the wealthy are doing better. 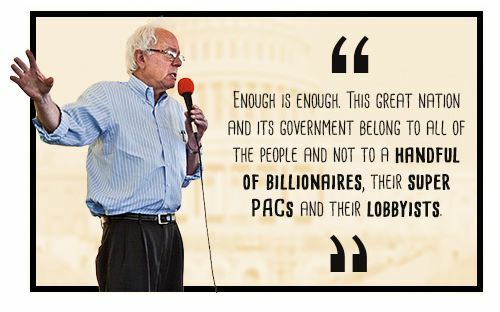 The only way we will maintain “This great nation and its government belong to all of the people” is by keeping Democrats like Sanders out of office. Well written! Thank you Lew. I’m unclear why you think Sanders is a Democrat. I’m also unclear what the difference is between R & D — seems like both support the Trans-Pacific Partnership (that supports Malaysian slavery and is a direct violation of Constitutional rights)/illlegal NSA violations on American’s privacy/never-ending war on terror. Recall that Obama-Care is a clone of Romney’s insurance plan, and he was the R’s nominee for President. On the other hand, Sanders opposes intervention in the Middle East, as well as restrictions on the NSA. Seems like he is the best supporter of the 1/4/5 amendments. Who do you support more than Sanders? Sanders is good at tickling ears. Currently I am not supporting anybody, waiting for the field to be thinned some, but I can tell you, I have not seen a Democrat worth voting for in decades. As for why do I call Sanders a Democrat, if he isn’t why is he seeking the Democrat Parties nomination for president? Perhaps the same reason the Libertarians are in the Repub party? When’s the last time the playing field has been level for the “third” parties? Is it really “leveling third parties” to have one infiltrate and weaken a party so they can take it over? If third party ideas do not sell as their party, what makes anybody think they will sell presented from another party? And if people aren’t buying your third parties positions, maybe you have the wrong positions or not what the majority in the country want. Or, like liberals, do you feel everybody must live under your rules?